In the 1980s Archbishop Desmond Tutu became South Africa's most well-known opponent of apartheid, that country's system of racial discrimination, or the separation of people by skin color. In 1984, he was awarded the Nobel Peace Prize for his work in South Africa. South African apartheid allowed white Africans, who made up 20 percent of the population, to reserve for themselves about 87 percent of the land, most natural resources, and all meaningful political power. Black Africans who found themselves in lands reserved for whites were made citizens of one of ten homelands, which the white-controlled government (but virtually no one else) called nations. In order to remove black people from areas reserved for whites, the government kicked out many from their homes, though their families had in some cases occupied them for decades. Black South Africans in the Republic were forced into the lowest-paying jobs, denied access to most public places, and had drastically lower life expectancies than whites. Meanwhile, white South Africans had one of the highest standards of living in the world. declared a state of emergency in June 1986, more than two thousand individuals had been killed. Against this backdrop Desmond Tutu emerged as the leading spokesman for nonviolent resistance to apartheid. Desmond Mpilo Tutu was born on October 7, 1931, to Zachariah and Aletta Tutu, in Klerksdorp, a town in the Transvaal region of South Africa. Tutu was born a Methodist but became an Anglican when his family changed religions. The Tutu family moved to Johannesburg, South Africa, when Desmond was twelve years old. In Johannesburg he first met the Anglican priest Trevor Huddleston who was strongly against apartheid and became Tutu's main role model. At the age of fourteen he contracted tuberculosis, a terrible disease which effects the lungs and bones, and was hospitalized for twenty months. He wanted to become a doctor, but because his family could not afford the schooling, he became a teacher. When the government instituted a system of racially discriminatory education in 1957, a system that would separate black students from white students, Tutu left teaching and entered the Anglican Church. Ordained (declared a priest) in 1961, he earned a bachelor of arts degree in 1962 from the University of South Africa, and then a master's degree from the University of London. From 1970 to 1974 he lectured at the University of Lesotho, Botswana, and Swaziland. In 1975 he became dean of Johannesburg, a position from which he publicly challenged white rule. He became bishop of Lesotho in 1976, and in 1985 bishop of Johannesburg. A short fourteen months later, in April 1986, he was elected archbishop of Cape Town, South Africa, the first black person to head the Anglican Church in southern Africa. By the 1980s clergymen (religious leaders) were among the most passionate opponents of apartheid within South Africa. Allan Boesak, a biracial minister, and Beyers Naude, head of the Christian Institute, were unusually outspoken. Naude was silenced in the late 1970s by being banned, a unique South African punishment by which the victim was placed under virtual house arrest (forced to stay at home by court order) and could not speak or be quoted publicly. 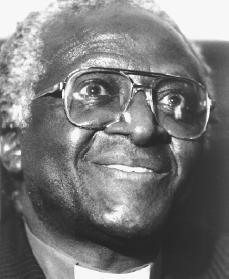 Tutu's international recognition as a critic of apartheid came when he became first general secretary of the South African Council of Churches in 1978. The problem faced by antiapartheid clergymen was how to oppose both violent resistance and apartheid, which was itself increasingly violent. Tutu was determined in his opposition, and he spoke out both in South Africa and abroad, often comparing apartheid to Nazism (a radical movement of racial superiority led by Adolf Hitler [1889—1945]) and communism (where a strong-handed government controls goods and services within a country). As a result the government twice revoked his passport, and he was jailed briefly in 1980 after a protest march. Tutu's view on violence reflected the tension in the Christian approach to resistance: "I will never tell anyone to pick up a gun. But I will pray for the man who picks up a gun, pray that he will be less cruel than he might otherwise have been.…"
Another issue Tutu faced was whether other nations should be urged to apply economic sanctions (limitations) against South Africa. Many believed that sanctions would hurt the white-controlled economy, therefore forcing apartheid to end. Others believed the sanction would hurt the black community more. Tutu favored sanctions as the only hope for peaceful change. He also opposed the "constructive engagement" policy of U.S. president Ronald Reagan (1911–). When the new wave of violence swept South Africa in the 1980s and the government failed to make fundamental changes in apartheid, Tutu pronounced constructive engagement a failure. In 1989 F. W. de Klerk (1936–) was elected the new president of the Republic of South Africa. He had promised to abolish apartheid, and at the end of 1993 he made good on his promise when South Africa's first all-race elections were announced. On April 27, 1994, South Africans elected a new president, Nelson Mandela, and apartheid was finally over. Mandela symbolized South Africa's new freedom, since until 1990 he had spent twenty-seven years as a political prisoner because of his outspoken opposition to apartheid. In 1997 Tutu received the Robie Award for his work in humanitarianism. The award came in the midst of Tutu's battle with prostate cancer, and shortly after the presentation he announced plans to undergo several months of cancer treatment in the United States. As head of South Africa's Truth and Reconciliation Commission, a group that investigates apartheid crimes, Tutu planned to set up an office in the United States, where he could continue his work throughout the rigorous cancer treatment. It was determined in October 1999 that the cancer had not spread to other parts of Tutu's body. In August 2001, Tutu returned to South Africa after spending two years in the United States undergoing cancer treatment. Receiving the Robie was certainly not Tutu's first recognition: he was the second South African to earn the Nobel Peace Prize. The first was Albert Luthuli of the ANC, who received it in 1960 for the same sort of opposition to apartheid. Bentley, Judith. Archbishop Tutu of South Africa. Hillside, NJ: Enslow, 1988. Du Boulay, Shirley. Tutu: Voice of the Voiceless. Grand Rapids, MI: Eerdmans, 1988. Lantier, Patricia and David Winner.. Desmond Tutu: Religious Leader Devoted to Freedom. Milwaukee: G. Stevens Children's Books, 1991. Lelyveld, Joseph. Move Your Shadow. New York: Time Books, 1985. Tutu, Desmond. The Rainbow People of God. New York: Doubleday, 1994.